Electronic Paper For The Visually Impaired | OhGizmo! By David Ponce on 11/29/05 • Leave a comment! So, everyone is frothing at the mouth over e-paper. And why not? What you’ll be able to do with that stuff is really mind boggling, but in the end, the visually impaired get a bum deal. Sure, you could say that they don’t really know what they’re missing, and you’d be right… but denying anyone the visceral pleasure of playing with new technology is just cruel. 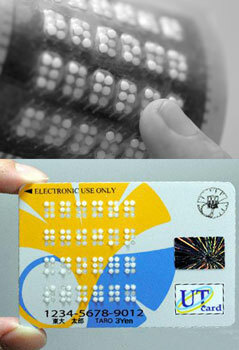 So, leave it to the thinking folk at the University of Tokyo to invent Braille e-paper. The device is about 1mm thick and contains 24 letters. It is even bendable. The letters can be refreshed about once a second. Of course this is at the prototype stage, but it’s cool to know that even the blind will be able to enjoy the e-revolution. Or whatever the hell you want to call it.